I have always felt that there is a fine line when it comes to RPG titles. If you take something such as Pokémon, you have a series that everybody can easily get in to, as it makes it as accessible for both young and inexperienced players while also providing enough depth for those that are more experienced. 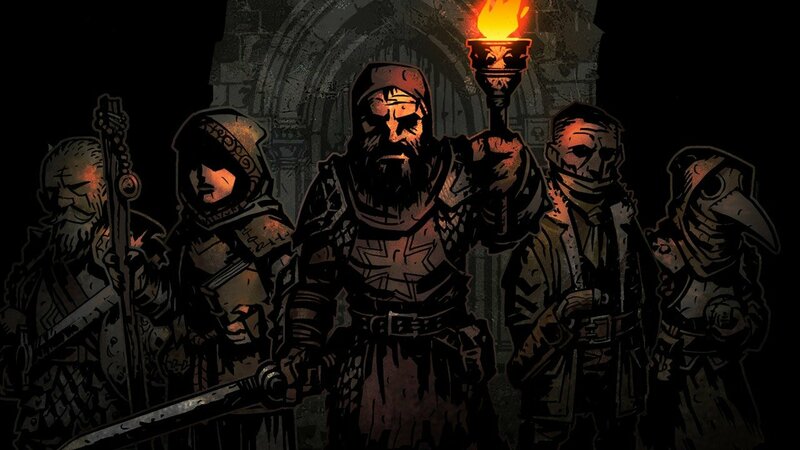 On the other end of the spectrum, you have an RPG such as Darkest Dungeon, which certainly won’t be for everybody because it doesn’t particularly try to be accessible for all. By no means should that be classed as a bad thing, however, as this is exactly the type of game that, in the right hands, could be one of the best games of the year. First things first, Darkest Dungeon is quite a challenge. There is a reason as to why every time the game boots up, you’re greeted with a disclaimer that warns you about characters dying frequently. It also tries to advise you to remember to make the most out of a bad situation, of which you will find yourself in a lot during the course of the game. That is, in many ways, the motto of the game. You will fail and you will sometimes feel like the game is being overly cruel to you, but you need to overcome that in order to succeed further down the line. Once you do succeed, it really does feel like you have accomplished something. Darkest Dungeon is probably best described as a turn-based, roguelike dungeon crawler, in which you manage a cast of heroes. If one dies, they’re gone. One of your main roles during the game is managing this roster, which you get to endlessly hire and add to as you go on. But it isn’t just about hiring heroes and having them die with no consequences involved. For example, some will have much better potential for you, the player, as they might have a certain attribute that you find to be more beneficial than others. So it can be a massive waste of time, effort and funds if you just go into it with the mindset of thinking you can just replace any dead heroes with new ones because while that is true, there’s more to it than that. Heroes can be divided up into many different categories and you will find that each one of them will be different in some ways to another. They may be a different class (of which there are plenty of). They may also have different skills, quirks and of course, completely different stats. Each character can also contract diseases, which will (of course) cause some kind of negative effect, with some being much worse than others. Stress is also a factor for your heroes and is accumulated through roaming dark dungeons, attacks from monsters and suchlike. The higher the stress levels, the bigger the issue, and this will lead to negative effects on stats, disobeying your orders and even causing other heroes to become more stressed as a result. Both diseased and stressed heroes can be healed by visiting various locations in the town, so it’s never as if a character can’t be saved from occurring such an ailment. So there are countless things you need to keep on top of at all times and this is what makes Darkest Dungeon a bit different than the norm. During the actual dungeon crawling sections, you take a team of four into the fray in order to complete quests, kill enemies and defeat bosses. It’s a risk-reward situation in terms of the type of team you take in. Do you take in a team full of heavy hitters to try and take down the enemies quicker, or do you play it safe and take in a mixture of classes, such as also bringing in a character that can take a fair bit of a battering to, with a healer and mage-like character thrown in for good measure, it’s all down to you and that’s what can make each dungeon and fight so fascinating. The battle system is very much akin to what you would find in other RPG titles, you have a variety of options to choose from, such as different attacks that can have various effects on enemies such as causing bleed damage and stun, melee and ranged attacks, which are pretty self-explanatory. The point is, it has everything you’d want in an RPG battle system. Upon completion of dungeons, you are given your just rewards and these can be in the form of trinkets that act not just as equipable items, but also a way of earning you some gold. Like all good dungeon crawlers, trinkets have different rarities and you, of course, will get very excited once you start to find some of the really rare stuff. The presentation on offer here is pretty fantastic, the game looks great. Black and reds are the primary colours used but it’s also surprisingly colourful in places. Considering it’s a game where dark dungeons play a key role, it’s such a joy to look at and everything just looks so stylish. It isn’t too shabby sound wise either, you have a narrator who does a good job in commentating as you make your way through dungeons too, and it never felt out of place, which can sometimes be the case. Here, however, it only added to the experience. On top of the base game, there is DLC that is already released, which can be bought as a bundle with the game if you choose. And, it doesn’t stop there as there are still DLC yet to be released at the time of writing. So, even with the amount of content on show already, there’s no sign of it stopping with plenty still on the horizon if you don’t want the action to end. Darkest Dungeon has already been released on other platforms, but I would argue that for the type of game it is, it’s probably at its best on the Switch with the portable nature of the console. It’s a title you may only play for 10 minutes at a time, but those 10 minutes bursts can wield great results. What I love about Darkest Dungeon is that it knows it’s difficult and it knows it’s going to challenge you. My biggest concern is that by the nature of what it sets out to be, it will put a lot of people off before they even play as it does require the player to put effort into it to understand all of the nuances and general aspects that simply isn’t there in most other games. It can be daunting but there are so many different parts to the game that it never gets boring. All I will say to close is that once you learn what you need to, it’s easily one of the best indie titles to grace the Switch and it is one that will keep you hooked for many weeks and months ahead.